Today, we’re excited to tell you that the Tablo ENGINE DVR app and the companion Tablo TUNER dual-tuner USB antenna adapter are now ready to help you transform your NVIDIA SHIELD set-top-box into an OTA DVR! You might be thinking… Wait a minute, wasn’t this called Tablo DROID? You’re right. But given that Tablo ENGINE is the driving force behind the Tablo DVR but in app form, we think the new moniker is a better representation of the app’s purpose. We hope you like it too! When you connect an Over-the-Air TV antenna to your NVIDIA SHIELD with a Tablo TUNER, the Tablo ENGINE app transforms your NVIDIA SHIELD into an Over-the-Air DVR that lets you discover, watch, and record live HDTV without the need for DVR hardware or an always-on computer. Unlike Tablo's network-connected DVRs (Tablo 2-Tuner, Tablo 4-Tuner, and Tablo DUAL) which stream live and recorded HDTV content to multiple devices, the Tablo TUNER/Tablo ENGINE software OTA DVR solution is designed for cord cutters who want to watch content on a main television screen connected to a powerful Android TV set-top-box via HDMI. Watch, pause and rewind live TV in stunning full HD quality (MPEG-2). Tune to live TV in seconds from the live TV grid guide. Watch, pause, rewind and fast forward completed and in-progress recordings. Completed recordings will include fast forward preview thumbnails that make it easy to zip through commercials or find a specific point in your recording. Browse and set recordings for shows airing over the next 14 days. Discover new shows and set one-click series recordings (ALL NEW or ALL episodes) via the Netflix-style program guide views. Enable Dolby 5.1 Surround Sound pass-through for a premium audio experience. A companion browser-based app for Tablo ENGINE is also available at my.tablotv.com for managing recordings and adjusting Tablo ENGINE’s settings when you’re on your local network. Tablo ENGINE includes a free, fully-featured 30-day trial of our Tablo ENGINE Guide Data Subscription. Once your trial is complete you can choose to use Tablo ENGINE without a subscription but if you want to enjoy the full Tablo experience, a subscription is recommended. For $3.99 USD/$4.99 CAD monthly or $39.99 USD/$49.99 annually, our guide data provides the beautiful cover art, episode and series synopses and metadata that make it easy to browse content and set recordings via the Tablo ENGINE app. Without a subscription, you will be limited to 24 hours of guide data and can continue to enjoy live TV, but no recording functions are available. Already have a Tablo OTA DVR subscription? Since the Tablo ENGINE solution represents a distinctly different video delivery method and doesn’t stream locally or out-of-home, we’ve created unique plans and reduced pricing that reflect this new feature set. If you’re interested in adding Tablo ENGINE to your existing Tablo OTA DVR implementation, a new Tablo ENGINE subscription can easily be added to your account via the online portal. Tablo TUNER is a dual-tuner USB adapter that connects your HDTV antenna to your Nvidia SHIELD streaming set-top-box. It works with the Tablo ENGINE app to let you enjoy live and recorded OTA TV content without the need for additional DVR hardware. As a dual-tuner device, Tablo TUNER will let you watch live or record up to two OTA TV channels at once using the Tablo ENGINE app. Tablo TUNER is available now from the Tablo web store for $69.99 USD/$89.99 CAD. 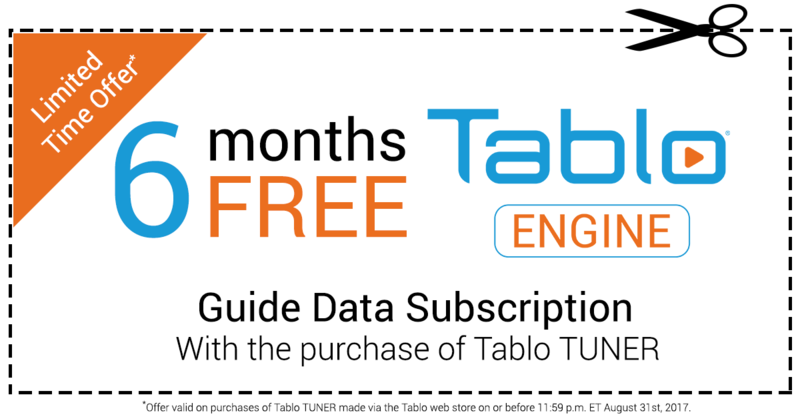 As a special introductory offer, with the purchase of a Tablo TUNER adapter, we’re giving you 6 months of Tablo ENGINE guide data subscription absolutely free. Enjoy 6 months of Tablo ENGINE guide data absolutely free! Introductory offer is available to residents of the United States and Canada. Can I use Tablo TUNER/Tablo ENGINE with Android TV devices other than Nvidia SHIELD? No, not at this time. At launch Tablo TUNER/TABLO ENGINE is restricted to use with the Nvidia SHIELD Android TV device. We are however exploring expanding support to additional devices. Does Tablo TUNER/Tablo ENGINE allow me to stream video to other devices? No. The Tablo TUNER/Tablo ENGINE solution is designed to deliver high quality audio and video from your Nvidia SHIELD to a single TV screen. If you want to watch content on multiple televisions, mobile devices or your PC/MAC we recommend a hardware-based Tablo OTA DVR. What video format does Tablo TUNER/Tablo ENGINE use? How much hard drive space do recordings use? Tablo TUNER/Tablo ENGINE delivers the raw MPEG2 video stream directly to your TV via the Nvidia SHIELD. When recorded, this full quality video stream requires a significant amount of storage space - up to 8GB/hour of HD video. Does Tablo TUNER/Tablo ENGINE support closed captioning? No. The Tablo TUNER/Tablo ENGINE solution does not support closed captioning at this time. If closed captioning is important to you, Tablo DVRs do support closed captioning on a number of devices. Looking for more info on Tablo ENGINE and Tablo TUNER?